All of us are looking for ways on how to save money on groceries. Here are some tips for families that I hope will help everyone! Make a meal plan for the week before you go for groceries so that you’re sure of what you need. Making a list is a very important step to save money on groceries. You can work on the list through out the week based on things you run out of and your meal plan. I make the list on my phone. Some people find it easier to start the list on paper and put it on the fridge to add to throughout the week. Before you go for groceries, clean out the fridge and peek in your pantry to make sure of your needs and update your list. You will be surprised at how many things you already have at home! Some grocery stores charge you for bags so bringing your own cloth bags is one way on how to save money on groceries. However, this is also great for the environment and a great green habit. Show constraint and stick to your list! If your grocery store offers an option to do shopping online and just pick up, use that! If you go on an empty stomach you will pick unhealthy snacks that you don’t even need! If possible, go without the kids! If you absolutely have to take them along, make sure you tell them the plan and that you will buy only what is on the list. Model good behaviour by sticking to the list yourself. Bribing the kids with a treat in the end for behaving throughout is totally acceptable also! Make sure you get the best of the lot by inspecting what you pick for your cart. Perishables like milk usually have longer best-before boxes at the back. Make sure you check the quality of all produce especially in boxes like that of strawberries. Organic produce is more expensive but did you know that you don’t have to buy all fruits and vegetables organic? Below is a good reference of what is good to buy organic and what fruits and vegetables are ok to eat inorganic. Frozen fruits and vegetables are usually less expensive and are great to be added to smoothies or for baking. It’s good to keep your eyes on deals but be smart about it. Only stock up on things that you will use, have space for and those with a longer shelf life. Smartphone apps are great for price matching and I love Flipp. Reebee is also a great app for finding deals across stores and Checkout51 provides information on deals along with cashback. Make sure your grocery store does price matching since not all do. A few people are great at couponing (I’m not one of them). If you find coupons for items that are regulars on your list, that’s great! But be careful about hoarding. Unnecessary trips to the grocery store cost a lot of money since you end up buying more things. If you run of items in the middle of the week, try to do without or find alternatives. This is a personal tip, but donate every time you do grocery and you will truly see the positive effects of this charity on your grocery budget. You can donate items to the food banks (collection bins usually found inside the store) or give to the needy yourself. Utilize reward cards to get the maximum benefits out of it. Some grocery stores have their own reward cards while most credit cards provide points. For coriander leaves to last longer, put them in the fridge in an airtight container with a raw egg. They will easily last for 3 weeks. This works for mint leaves, basil, strawberries and spinach also! Keep potatoes and onions separate for them to last longer. Cover the stems of bananas with aluminium foil for them to last longer. Hope all these tips help you! 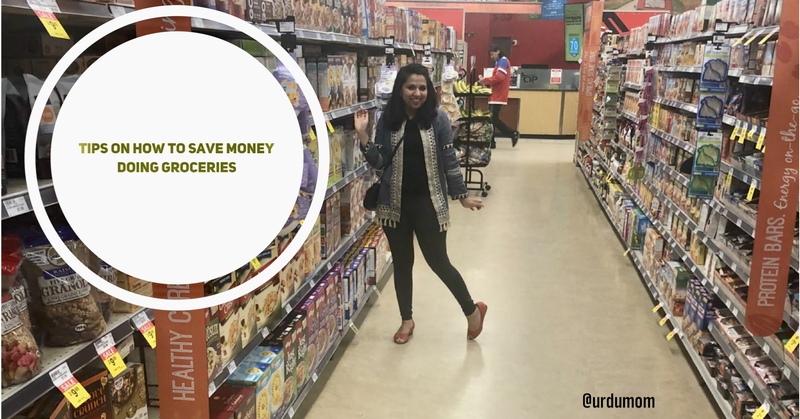 Let me know what are your tips on how to save money on groceries?